For many, the mention of a Mexican restaurant is apt to be laced with certain stereotypical expectations. In that sense, Toro Latin Kitchen and Bar is confounding in its thoughtful dovetailing of old and new. The location – within the posh Esperanza Auberge resort on the southern tip of the Baja California peninsula – is spectacular. 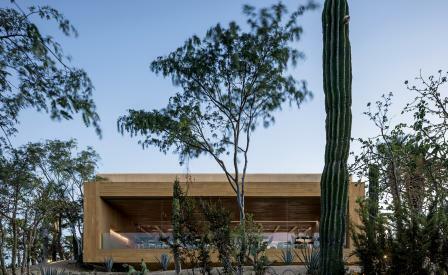 Here, Brazilian architect Arthur Casas frames the views of the Pacific Ocean and the arid desert vegetation through an unobtrusive rectangular timber frame. The ideal of the traditional adobe – all earth-tones, twig pergolas, straw ceilings and timber rafters, rustic wooden cabinets and flower boxes – is quietly countered by modern notes like Corten steel beams, ceramic pots lined up on shelves suspended on steel cables, and classic furniture by Luis Barragan and Clara Porset. It’s a perfect setting for legendary chef Richard Sandoval’s pan-Latin cuisine of cocas-style mushroom flatbread and tomato-watermelon salad, achiote barbecued salmon, and crisp Baja fish taco.